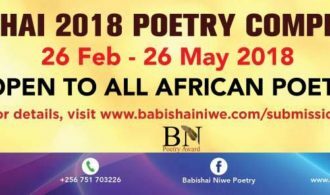 The Babishai Poetry Prize 2018 is looking for submissions for this year’s edition of prize; the winners will be announced at the Babishai Poetry Festival 2018 in August. The Babishai Poetry Prize was founded in 2009 by Ugandan Beverley Nambozo Nsengiyunva to shine a light on the Ugandan women poetry scene. The prize would go to Lillian Aujo (2009, Sophie Brenda Alal (2010), followed by Sanyu Kisaka (2011), and Susan Piwang (2012). Realising that their organisation is the only one coordinating annual African poetry competitions, whose secretariat is based on the continent, the Babishai Niwe Poetry Foundation expanded the prize to both genders and all Africans. The prize would subsequently be won by Tom Jalio (2014), Adeeko Ibukun (2015), and Sanya Noel and Moyosore Orimoloye (2016). Open to ALL African poets who will not have published a full length poetry collection by July 2018. Send 5 original unpublished poems in English using the online portal on the website. We will not accept email submissions; only those sent from the website portal. Previous online publications will not be considered. Poems must be single-spaced, between 10 and 40 lines each and sent as Word Attachments. DO NOT include your name on the poem itself. The longlisted poets will be announced in June. The shortlisted poets will be announced in July. Winners will be announced during the #Babishai2018 poetry festival, 3-6 August in Kapchorwa, Mbale, Eastern Uganda. Any form of plagiarism will lead to immediate disqualification. Judges to be announced in March. Submissions will be accepted from 26 February to 26 May, 2018. Update: The deadline for this call out has since passed. I am still in high school and I wanted to ask, if I get to win the competition is there any chance that my school may be notified upon request? I’m not sure about this. I suggest you ask the competition organisers either on their social media platforms or on their website at http://babishainiwe.com/contact-us/. hey, when will be the next competition? Next year. I’ll post about it when they do the callout. We’ll post up information as soon as it becomes available. I would love to be part of this noble idea of creative writing. Thank you to all who have made this happen. when is the next submission? Hi Seroney. As soon as we know, you’ll know.